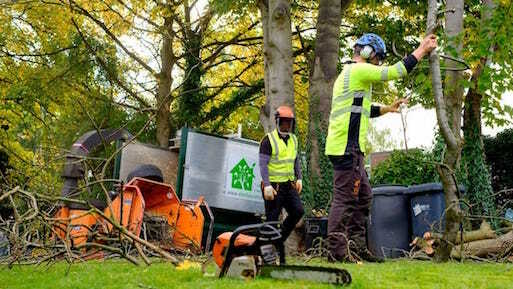 Tree Surgeons in Whitefield – we are friendly, reliable and affordable. If you are looking for a tree surgeon in Whitefield then you are in the right place! We are professional tree surgeons with over 30 years of experience and pride ourselves in being professional, timely and deliver work of a high quality. We take insurance seriously and are fully insured for every eventuality and are also competitively priced when put side by side with other tree surgeons in Whitefield. You can be sure that when we quote, you are getting our best quote that we can put forward. We also pride ourselves in responding very quickly if you get in touch with us so that we can help you get your problem fixed ASAP. We have City & Guilds NPTC qualifications. We always have a plan and the right tools when we show up. Whilst keep our quality high, we also get the job done in a timely manner. We do what was asked of us and tidy up after ourselves. We recycle everything that we chop down. We endeavour to keep our prices reasonable & competitive. No messing, simple service executed in a professional manner. We are professional, but nice guys to boot!